Successfully Added Xiaomi Mi Pad 2 Tablet PC - 7.9 Inch Retina Screen, 64 Bit Intel Atom CPU, 2GB RAM, Dual Band Wi-Fi, 6190mAh Battery (Gold) to your Shopping Cart. 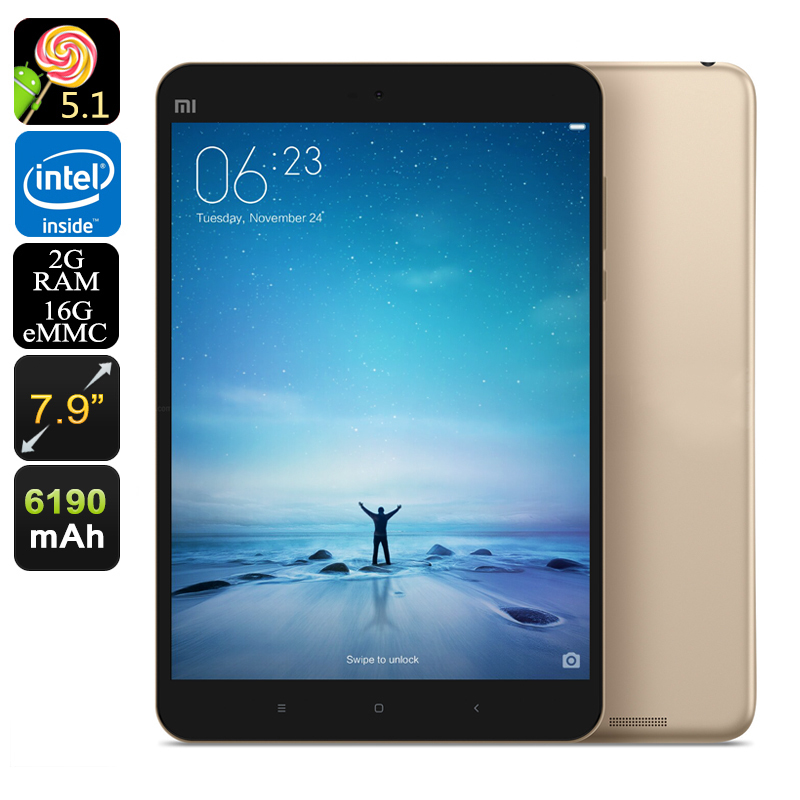 The Mi Pad 2 is a 7.9 inch tablet from Xiaomi, China's answer to Apple. With its high-resolution retina screen, so you can enjoy 2048x1536 pixels that equates to more than 300 per inch, so everything looks pin sharp and perfect on this great screen. With the Intel Atom X5-Z8500 CPU clocked at 2.2Ghz and 2GB of RAM there is plenty of grunt in the power department and this is one of the few tablets you will find with a high-end 64-bit atom CPU its also going to be one of the fastest. It has a respectable 16GB of internal storage offers sufficient space for games and apps. All of which can be downloaded from the Xiaomi APP store or Google own Play store. OTG is also supported on this slim 7.9 inch tablet so it's easy to store files externally. On top of that is dual band Wi-Fi connectivity ensuring super-fast wireless file transfer so streaming movies, playing games online or keeping up to date on social media are quick and seamless. Xiaomi like to offer its users a taste of something a little different so rather than the standard Android 5.1 interface you will be greeted by the firms custom MIUI launcher. The simple straight forward launcher is easy to use but looks a little different from a standard Android interface. While the skin may be different a quick flip to the settings will reveal that all the main android settings are available as well as a few custom add-ons thanks to Xiaomi's custom system. Like all tablets the Mi Pad 2 is designed as a multimedia tool letting you connect to the online world while delivering great audio and visual entertainment, to that end it has a dual speaker setup that brings high-quality audio to accompany those stellar graphics. To keep you entertained for longer and power the Mi Pad 2 throughout the entire day it has been packed with a 6190mAh battery. This is a fairly sizable power unit for such a slim compact tablet and means you can expect some good usage times from every charge. This Android 7 Inch Tablet PC comes with a 12 months warranty, brought to you by the leader in electronic devices as well as wholesale Android Tablet PCs.